Economy Minister Sheikha Lubna Al-Qassemi, the first woman minister in the United Arab Emirates, has launched her own perfume with part of the proceeds going to charity, the Khaleej Times newspaper reported today.Sheikha Lubna unveiled the fragrance - "Mukhalat Sheikha Lubna" - at the Dubai branch of the luxury Saks Fifth Avenue store.The event was held recently with several VIP guests present, including Shaikha Lubna and her associates, Saks Clients and members of the media. 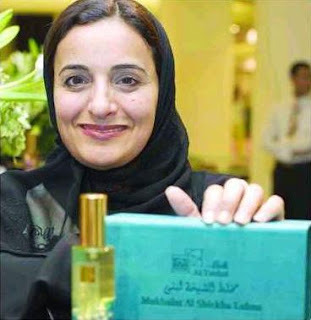 20 per cent of sales made on Mukhalat Shaikha Lubna will be donated to the Friends of Cancer Patients, a charitable organisation based in Sharjah.“Fragrance is known to stir positive emotions in a woman’s heart — the new mukhalat will stir even more emotion as 20 per cent of the sales will be donated to the Friends of Cancer Patients," said Shaikha Lubna.Shaikha Lubna’s patronage comes as a form of support to young national women entrepreneurs. 'Mukhalat Shaikha Lubna' is the creation of Al Tanhat Company that is specialized in producing and mixing Arabian perfumes.